Dr. Abidoye Gbadegesin, Head of Department, Obstetrics and Gynaecology (LASUCOM/LASUTH) 2014 till date. A native of Oyo State. Had his Primary and Secondary School in Oyo State. Proceeded to University of Ife, Ile-Ife to read Health Sciences, graduated with a Second Class Upper Division in 1980, graduated with M.B.Ch.B in 1983. Had his housemanship at Adeoyo State Hospital, Ibadan, Oyo State and had his National Youth Service at Ifo/Ota Local Government Medical Unit, Ota, Ogun State. He became a Fellow of West African College of Surgeons in Obstetrics and Gynaecology in 1995. Worked in different public health sectors at different capacities including Lagos Island Maternity, Lagos. He was a Consultant at Ayinke House Maternity, Hospital, General Hospital, Ikeja while later became department of Obstetrics and Gynaecology of Lagos State University Teaching Hospital, Ikeja in 2003. Specializes in Maternal and Fetal Medicine. Presently, the Vice Chairman, Society for Obstetrician and Gynaecologist of Nigeria, Lagos Sector. 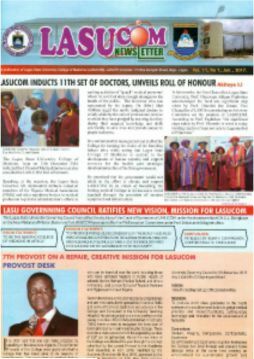 The clinical wing of the Department of Obstetrics and Gynaecology of the Lagos State University College of Medicine is based in Ayinke House, LASUTH which has 153 Obstetric and Gynaecology beds and 19 cots. Appreciate the principles and practice of the specialty of Obstetrics and Gynaecology on the basis of the Physiology and Applied Anatomy of pregnancy, labour, puerperium and the methods to control conception. Obtain relevant clinical history and elicit physical signs, collate, record and methodically analyze the information towards objective care in obstetric and gynaecological patients. Describe the common gynaecological diseases, their possible causes, progression, complications, management and prevention. Understand the principles and practices of antenatal care and sufficiently know the normal course and parameters in pregnancy to be able to recognize deviations and Making accurate clinical decisions followed by appropriate actions for such cases. Manage the normal and abnormal deliveries and be aware of the principles underlying them. Practise with good bedside manners, ethical standards and have deep respect and Concern for his patients. Departmental activities are broadly divided into Clinical, Teaching and Research. The Clinical Department consists of 5 firms, labeled Red, Orange, Yellow, Green and Blue. Each firm consists of Consultants, Senior Residents, Residents and House Officers. Each firm conducts one Gynaecology Clinic, one Antenatal Clinic and Family Planning Clinic weekly. Each firm also takes weekday call duty on rotation while weekend calls are shared. The firms run elective operative theatre sessions on their call duty days. Consultant teaching ward rounds are according to the rosters, while Departmental Clinical Meetings are held on Wednesdays. Issues such as perinatal mortality reviews, Maternal Mortality review, basic science lectures and Consultants' lectures and case presentations are also discussed. Students clerk patients, observe and assist at operations and deliveries and they must give evidence of having delivered at least 10 babies during their posting. Students are required to be signed up for lectures, tutorial, operations, deliveries and patient clerking and partograms. A booklet for undergraduate clerkship is specially provided for this purpose. Students are assessed on a continuous basis with two In-Course assessments. The first In-Course Assessment is held after 6 weeks while the second comes up at the completion of the posting. The first In-Course Assessment consists an MCQ paper and Essay Paper I & II on Obstetrics and Gynaecology. The second In-Course Assessment consists of an MCQ paper and Essay paper on both subjects. There is Clinical Examination in the form of OSCE. Students are allowed to take this examination only on satisfactory completion of booklet on undergraduate clerkship. The final assessment is a part of the 3rd Professional Examination and consists of MCQ, Essay papers I & II and OSCE and long cases in Obstetrics and Gynaecology. External examiners are invited to moderate the 3rd Professional Examination. Please make a gift today to support learning and discovery. Your University relies on support to provide a first-class learning experience, and fund world-changing research. This is to announce that Year 2017 Children's Day Party will hold on Saturday 27th May, 2017. Only first 350 children to register would be admitted for the party which has promised to be a bumper package. Part of the highlight include face painting, bouncing castle, distribution of gifts and all round entertainment including a happy time with the kids.